Aside from the modern studio and its new gadgets, the team officially became complete with the addition of three Concordia alumni: Catherine Verdon-Diamond, Laura Casella and Elias Makos. Photo by David Adelman. It is no secret that the Montreal anglophone job market for television newscasters is quite limited and the competition to fill these positions is extremely demanding. 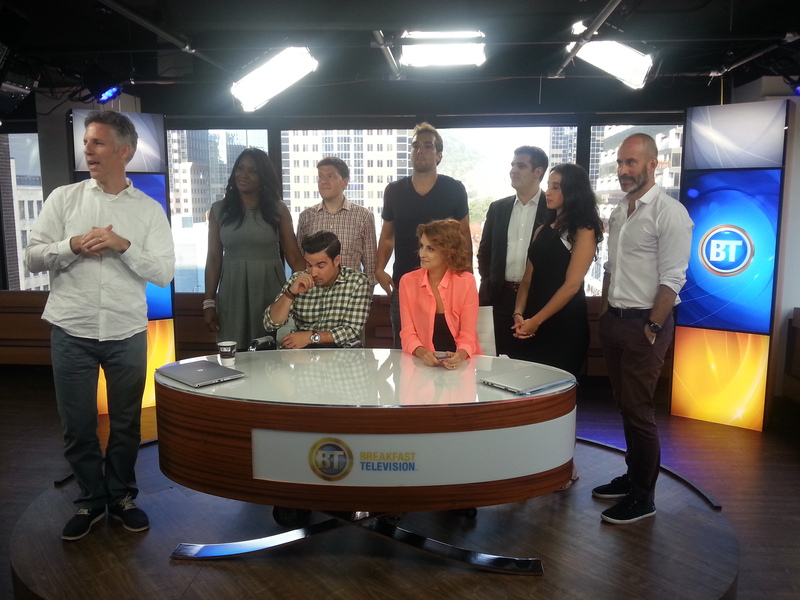 However, some Concordia journalism graduates have found a home on City Montreal’s newest local morning show, Breakfast Television. City’s Breakfast Television has had successful precedents in other Canadian cities, dominating morning television with its fast-paced, interactive segments. That’s why Rogers Media designed an exciting new studio inside its downtown Montreal headquarters built with state-of-the-art technology to broadcast new media. This will include an immense video wall that features nine flat-screen monitors and a 65-inch interactive touch-screen monitor that will give the audience a unique perspective to what’s happening worldwide through the lens of social media. To top it off, the live reporters on the team will be out in the field using a new broadcast technology called Dejero which relies on newer cellular systems and is more efficient when compared to older methods of transmission. Aside from the modern studio and its new gadgets, the team officially became complete with the addition of three Concordia alumni: Catherine Verdon-Diamond, Laura Casella and Elias Makos. For the show’s executive producer and local content manager, Bob Babinski, this feels like “old home week”. A journalism professor at Concordia University for over 25 years, Babinski has worn many hats in the world of television, both on-camera and behind the scenes, which has led him to Breakfast Television alongside students he taught almost a decade ago. “It just goes to show you how significant the Concordia journalism program has been in the city over the years, that any newsroom in the city is dotted with Concordia graduates. I’d like to think that it’s a tip of the cap to the success of the program,” said Babinski. Montreal can be a tricky market because there are not always many opportunities in broadcasting, but for Makos, Breakfast Television’s new media producer and commentator, landing this position couldn’t have come at a better time. “You don’t get to work with this caliber of high-energy individuals all together very much in a career,” said Makos, who is more psyched about the team he’s working with than all the new gadgets he’ll get to play with. “My focus has always been around technology and everything new media, but one of the reasons why I am more excited to be here is this versatile team and fast-paced show… that will be unlike anything the Anglophone market in this city has seen,” said Makos, who can’t wait to operate the 65-inch monitor. “For a long time I wanted to be on television, but I didn’t know how to go about it,” said Verdon-Diamond, who had originally planned on being an algebra teacher. Though she studied mathematics in university, she somehow found herself years later working behind-the-scenes at the CBC. “Then, all of a sudden this opportunity came up, my boss at the CBC suggested I try out reporting. I was doing weather for the 11 p.m. news and now I will be heading to work at 4 a.m. to prepare for this show,” laughs Verdon-Diamond, who will be Breakfast Television’s traffic and weather specialist. The morning show premiered Monday Aug. 26 and will continue to air from 6 a.m. to 9 a.m. daily and is available to local service providers.